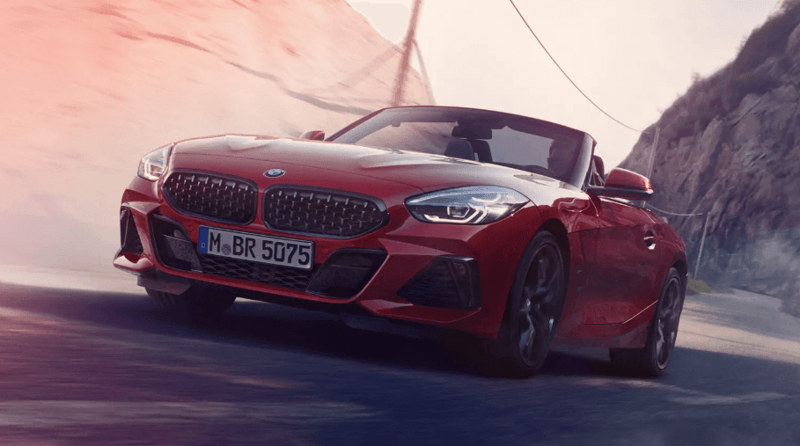 BMW has launched the all-new Z4 Roadster in India with new design and powerful driving dynamics, and it is available at all BMW dealerships across India as a Completely Built-Up Unit (CBU) model. Prices start at 64.90 lakh for the sDrive20i and 78.90 lakh for the M40i variants. The 2019 new generation Z4 has a more prominent sporty look. The Z4 Roadster exteriors are seen with BMW’s newly designed BMW Kidney Grille, L-shaped tail lamps, a long bonnet, integrated spoiler aswell as adaptive LED headlamps. The Z4 is a soft-top convertible that is capableof opening & closing its roof in 10 seconds while the car is still drivingat speeds of up to 50 Kmph. BMW Z4 M40i interior includes a leather and Alcantara with blue contrast stitching and blue piping. As an alternative to the standard Quartz Silver, the trim finishers can also be specified in High-Gloss Black, Aluminium Mesh Effect or Aluminium Tetragon. Further, M sports seats with additional adjustment options along with an M leather steering wheel form a part of the high quality cabin space. The all-new BMW Z4 Roadster Safety features include front and side airbags for the driver and passenger, Anti-lock Braking System (ABS) with Brake Assist , and Dynamic Stability Control along with collision and pedestrian warning with emergency braking, lane departure warning, and hands free parking,side-impact protection, electronic vehicle immobilizer and crash sensor and an emergency spare wheel.